Korea’s top spy agency chief Monday categorically denied allegations the agency used a hacking program to wiretap citizens during the first session of a bipartisan parliamentary committee that aims to probe any wrongdoings by the NIS. Lee testified before the National Assembly Intelligence Committee’s closed-door session, saying that the NIS had found no evidence of civilian surveillance following an internal investigation into computer files believed to hold evidence. “(The NIS) has never spied on civilians. I can put my NIS position at stake for this,” National Intelligence Service chief Lee Byung-ho was quoted as saying by Rep. Won Yoo-chul, floor leader of the ruling Saenuri Party. “Remote Control system, the hacking device the NIS purchased, was not able to listen in on mobile messenger KakaoTalk,” Lee was quoted as saying. His remarks came after the NIS retrieved computer files deleted by a deceased NIS official who had purchased and used the controversial hacking device. The 45-year-old cybersecurity expert took his own life over the escalating hacking scandal, leaving a letter denying any NIS involvement in wiretapping. Rep. Lee Cheol-woo told reporters that the NIS said a total of 51 files were deleted by the deceased NIS official. Of those, 10 files were related to antiterrorism operations while 41 were used for experiments for intelligence operations. Lee also reportedly suggested a meeting between lawmakers and NIS officials during an upcoming on-site NIS inspection. But Lee refused to disclose the hacking devices’ log files, despite calls from opposition lawmakers. The NIS said the disclosure would compromise the agency’s security capability to address North Korea’s cyber threats. The main opposition New Politics Alliance for Democracy asserted that the NIS could never clear its name unless they submitted the hacking device’s log files. Analyzing the files, the NPAD believes, would prove whether the hacking device targeted civilians. The NPAD continued to question whether the spy agency has retrieved all the deleted files, suggesting the possibility of a cover-up. NPAD lawmaker Rep. Ahn Cheol-soo, the former CEO of an antivirus software company, raised doubts over the NIS attempts to recover the files because they had taken an “unnecessary” amount of time recovering them. “Recovering (deleted) files should only take a few hours, but the NIS spent a whole week,” said Ahn. “If the NIS had started to recover the files right after they were deleted, we would have seen 100 percent recovery. But they didn’t. I wonder what they did and how they did it,” said Ahn. Ahn also said that three preconditions must be met for the parliamentary committee to conduct a “proper probe,” including the NIS submitting the log files, bringing at least five experts to analyze them and for at least a month to be alotted for the investigation. 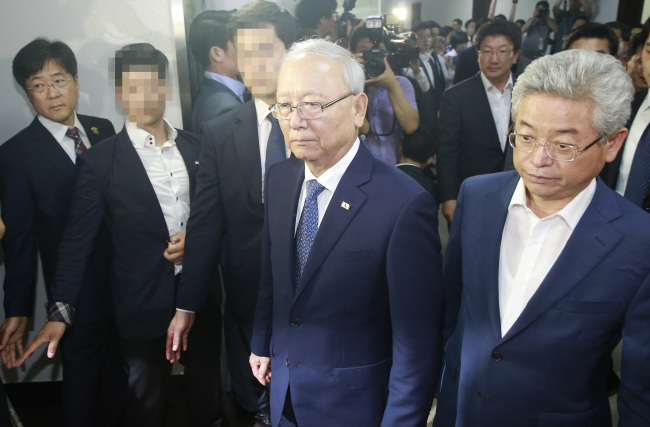 Ahn also said he was willing to transfer his shares in Ahnlab, an antivirus software company, into blind trust, pursuant to the NIS probe, referring to the Saenuri Party’s argument that NIS information cannot be revealed due to Ahn’s involvement with the private company. Meanwhile, the prosecutors decided Monday to refer the hacking scandal to a team specializing in national security cases. They said the decision was made taking into consideration that the team had been tasked with similar cases such as NIS civilian surveillance cases in 2002 and 2005.